When I’m not writing about apps, OS X, or iOS, I play roller derby with Boston’s all-star travel team. We’re currently ranked 16th in the world, which is pretty exciting—but it also means practicing and scrimmaging at an extremely high level, three to four days a week. And as anyone who has played a contact sport can attest, your body can get a little beaten up after just a few weeks. I started doing yoga at a studio last year in hopes of correcting any muscle imbalances and stretching out aches, and while it greatly helped, I didn’t always have the time or the cash to go on a regular basis. Enter Pocket Yoga: For the last six months, it’s been saving both my wallet and my muscles. Pocket Yoga offers three vinyasa-based sessions (Ocean, Desert, and Mountain) in 30, 45, and 60 minute varieties, along with two Sun Salutation variations that can be lengthened or shortened depending on the number of repetitions you’d like to do. Each session is also split up into three levels—beginner, intermediate, and expert—with more difficult poses as you rise through each difficulty. The classes themselves are beautifully illustrated cartoon sequences, set in your choice of locale, along with the soothing voice of a female instructor. The poses are drawn perfectly (“perhaps a bit too perfectly,” my inflexible body might protest), and while there’s no real animation between pose movements, you can easily fill in the blanks. You can pause the classes mid-session; broadcast them to an Apple TV or AirPlay receiver; or cancel and start over if you’re not happy with your performance. Each session starts out with a slow-paced, easy to follow warmup. The basic poses are introduced, tips for form and comfort are mentioned, and you’re given time to breathe and live within each one of them. After that, the sessions become more fast-paced, guiding you from one move to the next in a matter of breaths. As someone familiar with the basic tenets of yoga, this was a perfect pace for me; that said, I might recommend that complete newcomers go to a few in-person classes to get the form fundamentals down before diving into the virtual studio. You can even practice individual poses from Pocket Yoga's Pose library. 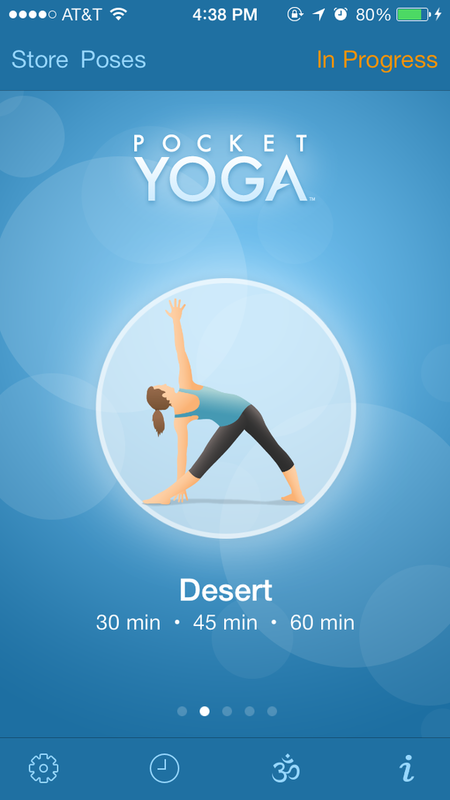 Pocket Yoga offers up its entire session arsenal after your initial $2 buy; the only in-app purchases available are for extra background locales (in case you want to spend your time doing poses in front of a digital Shiva). Between the levels and the time variation, however, there’s lots to work with; I’m six months in and still have yet to master an intermediate level session. And if you’re really itching for new variations, you can pick up the $10 Pocket Yoga Practice Builder and custom build an entire practice to your liking. If you’re having trouble with a particular pose, the app’s Pose library lets you view each one individually in both right side and left side variations. Poses are divided by category and difficulty, and also provide a short writeup that lets you know where you should start from and what benefits the pose provides. In short: Yoga’s not necessarily for everyone, but if you enjoy vinyasa-style and you want to be more flexible and relaxed throughout the day, you should definitely pick up Pocket Yoga. It’s a beautifully designed app with excellent programs and lots of information, and who knows? It might just banish your 3 p.m. workday blues. 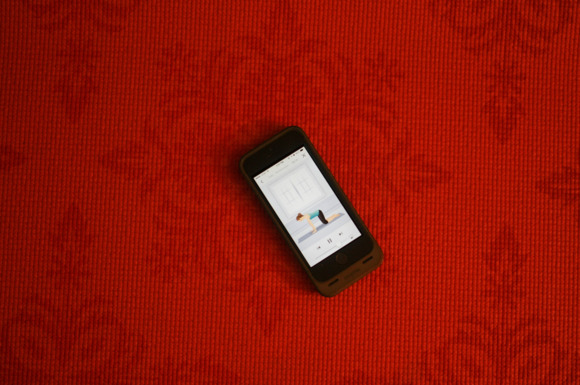 For those wishing to do a little yoga at home, Pocket Yoga makes a great companion.